A local, friendly spot serving good food, on the beach and with pretty views of Island Harbour, Pelican Bar is a laid-back spot to spend the afternoon. 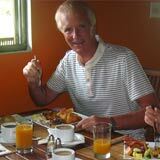 Visiting Anguilla and looking to eat and hang like a local? Or, on vacation and doing things economically? Or, simply searching for a genuine, down to earth spot in the sand, by the immensely blue sea? No worries, The Pelican Bar has you covered! 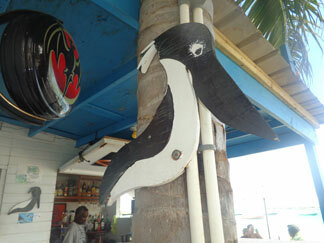 The Pelican Bar is located in Anguilla's charming fishing village, Island Harbour. It is right on the sand, by the sea, sitting spectator to all of the fishermen coming and going with their catches. 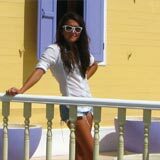 By now you've likely heard the rumors about Anguilla's nice and friendly people? It's true. And, I found many of them hanging out at The Pelican Bar! Where is this Affordable Anguilla spot? 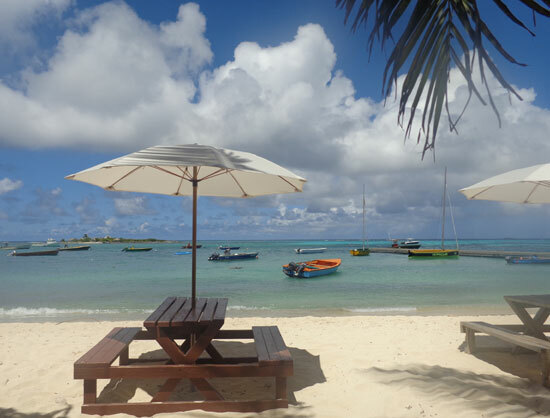 To find this hang out, drive to Island Harbour and (if you are coming from Shoal Bay) the beach and The Pelican Bar will be on your left, in the sand. It is a white wood structure with an open but covered space at the bar/order area. There are some picnic tables with umbrellas to shade you, too. If space is limited, drive past the wharf and park in the open area by the sea, just above the wharf. 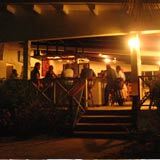 Walk down to The Pelican Bar where you are sure to see some smiling faces. 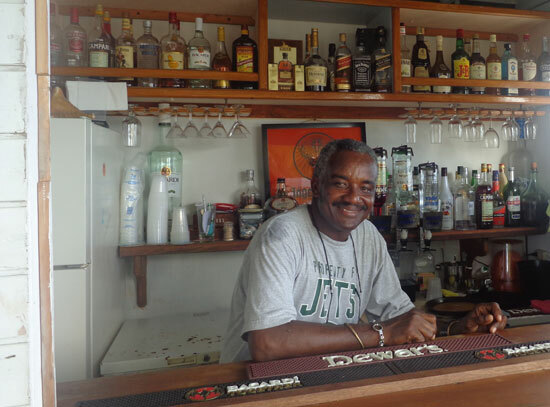 Often times, Patrick (the owner) and Brian are the Pelican Bar hosts on hand, ready to serve you a cold rum punch or a grilled fresh mahi mahi. Brian always has a smile. 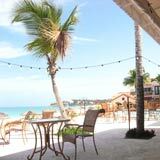 Sink your feet down into the white sand as the bar shades you from the sand. Sip your rum punch and take in the beautiful Island Harbour vista. A small, shimmering harbor, dotted with picture-perfect wooden fishing boats, children sailing Sunfish, Scilly Cay in the distance... it is special. If you choose to "lime" there, rest assured that you can take your time. Walk along the beach, dip in the sea, you will not be rushed out. Many locals spend their days here, enjoying conversation and the scene. Some are happy to tell you all about Island Harbour, the history, the reliance on the sea, and about any fish you may be interested to learn about. When your stomach begins to rumble, step up to the bar and place your order! If you want to eat local, have the fish. The Pelican Bar offers a variety of fresh fish. So do note, fish available will depend on what the fishermen have brought in... mahi mahi, jacks, old wife, red snapper, etc. I've had their pan-fried whole fish and a mahi mahi (which was neither "whole" or "filet" as it still had some bones which were easy to maneuver) and both were good. 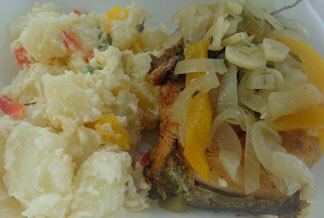 The mahi mahi was topped with sauteed onions and peppers and had great flavor. They are not fussy at The Pelican Bar. Choose whatever side you like to go with your food: potato salad, green salad, fry cake (aka Johnny cake) etc. If you are not a fan of seafood, they have nice-sized hamburgers. On the weekends you'll find chicken and ribs from the BBQ. A hamburger plate is $6 US. The BBQ and fresh fish plates will run between $8 and $10 US depending on your selections. Note: There is not a menu at The Pelican Bar. There is a chalkboard that lists food available and of course, Brian or Patrick can just tell you! 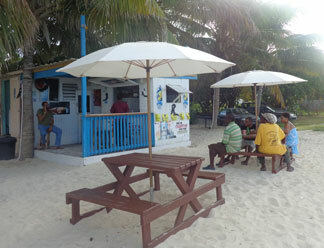 Keeping in line with the spot being an affordable Anguilla business, the drinks are refreshingly priced, too. Beer is $2 US and a cocktail (ex: a rum punch) is $5 US. Another nice point about The Pelican Bar is that they are almost always open! Every day except Thursday, you can stop by. Hours are "Caribbean-style" hours but generally open around 10:30-11am and close just after dinner time or later (depending on if there are customers who still want to hang out). Wow, the hamburger at that table smelled good! 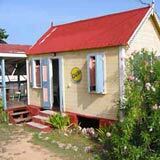 Keep this jewel of a spot in mind if you are looking to experience real Anguilla life and food. The Pelican Bar is about as local as it gets... friendly, tasty, and on the beach! Directions: On Island Harbour beach, just next to the wharf. A fun, local hang out. Hours: Daily for lunch and dinner.